Some things, you just can't make up. Walking to my boat this weekend, for the first time in about three months, I was taken aback. I was just plain taken. What was this? How could this be? Had the fates decided that my life hasn't been eventful enough lately? Of all the docks, in all the marinas, in all the world, she sails into mine. And right in my face, too. I have to walk right past this boat to get to mine. Is my little cockroach friend, Arnold, having some fun with me? He was, supposedly, a vers-libre poet in a former life. Is this some form of poetic justice? Is this his way of suggesting he needs some blogging companionship? Will he be inviting in friends to join him in his tapdance across my keyboard in the wee hours? If all of this cockroach talk has you baffled, you can find out more about Mehitabel's namesake here. I haven't met the owners yet. It's possible the boat has been in the marina for a while. There's been a lot of slip shuffling lately since they rebuilt some of the oldest docks on the other side of the marina. I don't recognize what type of boat this is, but it's probably from the mid-70s. More as I find out. Here's a slightly wider shot. Anyone have any idea what kind of boat or maybe know something about this particular one? On the interwebs, I did find an Islander 27 named Mehitabel in Seattle, but this is definitely not it. Think of this as a photo quiz without the free hat. Dunno, but maybe it's time to brush up on your capers corybantic? It' definitely not this catboat on Cape Cod either. Did you see the size of the outboard? Waterskiing anyone? And it's definitely not this Bounty II-Rhodes 41 either. 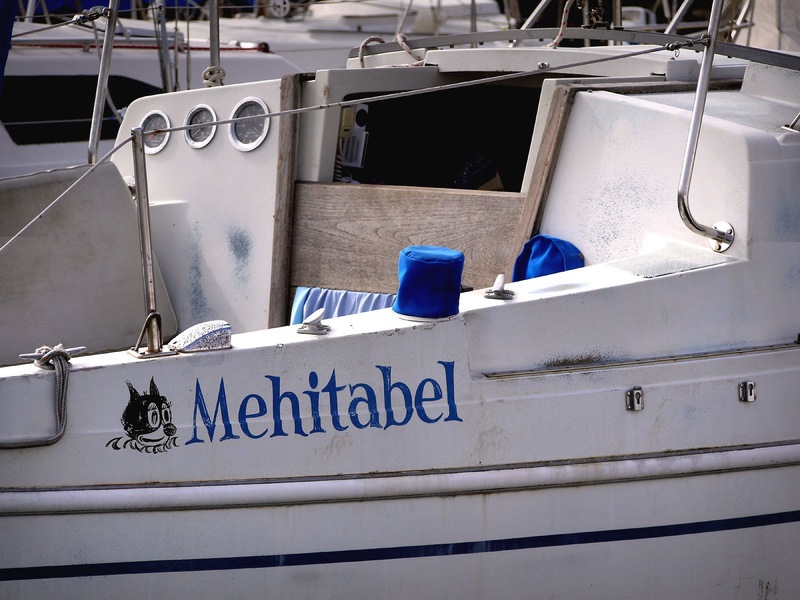 How many free hats can I not win by finding boats named Mehitabel that are definitely not this one? Baydog, the motor on this boat looks to be in better shape than anything else. 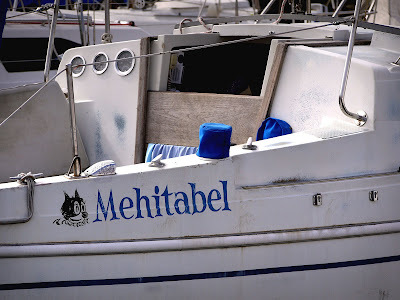 Maybe these are less sailors and more adventurers, like Mehitabel was. 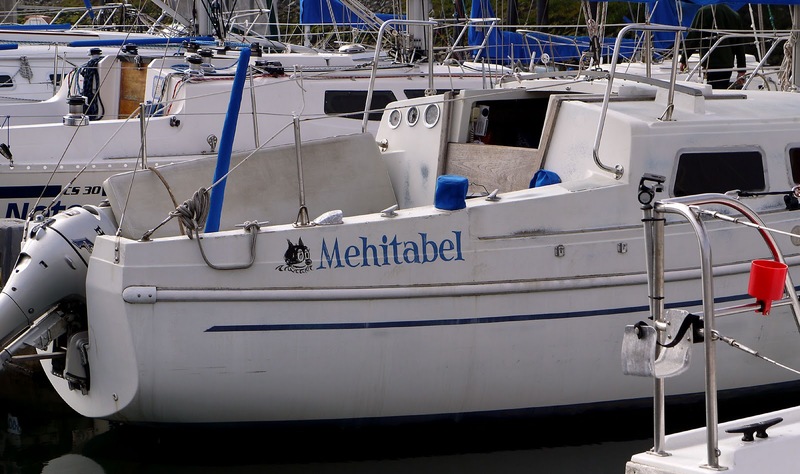 I think that may very well describe the owners of Mehitabel, the sailboat. Maybe I'll get to meet them soon. And I think you once said you don't care much for capers, but you needn't worry. These are capers of a different sort, I think. Lately, this blog is turning into capers of a different sort. If you want to know what Corybantic means, you're on your own. Tiller... uh, I mean Inert, if you're willing to ply The Google to keep coming up with boats this isn't, I'll keep not awarding you hats. If you like, I'll make those non-hats complimentary hats from the fair isle of Fair Isle. And speaking of Fair Isle, check out Tommy's post today for a different, seaside take on Valentine's Day. Corybantic means being in the spirit or manner of a Corybant. Doesn't everyone know that. How many free hats can I not win by not giving helpful answers to questions you have not asked? Inert, you're asking how many angelfish can dance on the head of a pinniped. O Docker, I actually love capers. Archie and Mehitabel remind me of the possum and alligator in the Pogo comics. wouldn't the pinniped just eat them for lunch? Or the pinniped could die and then its fossilized ivory could be turned into angelfish jewelry. By the way, how many angelfish earrings can you make from one fossilized pinniped head? These are questions philosophers have debated for years, from Thomas Aquinas to Duns Scotus, although why the Supreme Court of the United States should get involved is beyond me. I guess it also depends upon whether pinnipeds like their angelfish with capers and whether buffalo have wings. I remember someone saying, in one of those food feeding frenzies going on a while back, that they didn't like capers. It was either Baygod or Gadboy or Daybog or Baydog, I can't remember which, or who. And what is it with word verification today? Over at Proper Course, Tillerman mentions beer and up pops 'tringen' (trinken?). Now we're talking about food and and the word is 'pates' (pâtés?). I seem to remember it was actually Dagboy who said it after all! Yes, I think you're right, Baygod. And Zen, I think you've found the boat. I googled a few photos of early '70s Coronado 27's and this looks like a match. They used a distinctive rail mounted at the forward end of the cockpit (the coachroof is raised all the way across the boat near the beam, so no sidedecks there). If the owners have gone to the expense of fitting a new Honda outboard, they may have plans of fixing the boat up. As Mehitabel used to say, "There may be a dance in the old dame, yet." A Coronado is the first thing I thought of when I saw that recessed outboard mount. But I see Zen beat me to the punch. Oh, yes, and I love capers too. This thread now has me craving veal piccatta. A Coronado is the first think I thought of when I saw the little blue cover over the cup holder. 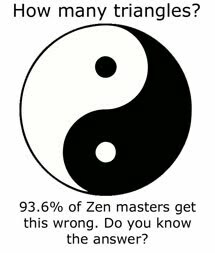 But I see Zen beat me to the kyūdō. Oh, yes, and I love tapirs too. This thread now has me craving Google Picassa. Ram, That's a winch cozy. Don't you Laser sailors know anything? A winch cozy is the first thing I thought of when I saw the little blue cover over the cupholder. But I see Badgoy beat me to the liftline. Oh yes, and I love tapers too. This thread now has me craving vibrato. Carol Anne, Zen has extensive training in the martial arts. I'd be very careful about trying to beat him to the punch. And Till Ramen, I'm glad to see that your campaign to sample every beer brewed in New England is working out so well. I'm looking forward to your full report. Ram En Lilt, did you know that the tapir is one of the few animals with a prehensile snout? Sadly, its ability to hold tools in its nose turned out to be one of those failed evolutionary experiments that led nowhere. All right, nobody look till I get my cork back in. That's not an outboard, it's a mud anchor for navigating the Norfork Broads. wv: gorti - Klatu's pet name for his robot.